In cases of pain or injuries to the facial region, the focus of our attention is normally the teeth. The gums and other soft tissues in the mouth like the tongue, lips and the cheek ling, are often ignored. The fact is that these tissues can also get damaged during sports accidents, falls, cheek bites, or due to drinking scalding fluids. These tissues can also suffer due to foreign material stuck between teeth or under the gum lining, and can cause abscesses which may become serious if the problem is not treated timely. Injuries to soft tissue in the mouth don’t usually cause excessive blood loss, but mixing of the blood with saliva can cause a scare. Any first aid treatment should start with an inspection to locate source of bleeding. Any foreign object stuck in there should be removed and then an attempt should be made to stop the bleeding. If possible rinse the mouth with a dilute salt solution in water. Any visible wounds can be cleaned with mild soap and water. Bleeding will normally be stopped by pressing a damp piece of gauze (or other clean material) to the site injury for a few minutes. If the bleeding does not stop professional medical attention is required. You should try to reach a dentist within about six hours. The dentist will inspect and assess the damage, make initial restorations, do suturing if required. Anti-biotic s and / or anti-tetanus injections may also be given. If foreign objects become lodged in the space between adjacent teeth or in the gums, it can cause irritation and has the potential give rise to infection. Husks of certain food items such as popcornare especially capable of lodging in the gum. Other itemslike bits of fingernails or splinters from wooden toothpicks can also cause injuries. If you feel that something stuck under the gum, try to remove it by a clean finger. If it is too small try using dental floss gently working the floss up and down below the gum line to dislodge the object. A light pressure from the point of a toothpick may also help free it. However, you should avoid pressing too hard and make sure you do not push the object in deeper. If that does not work, see a dentist as early as possible. He has the necessary tools to remove the object and repair any injury. He may also give you the necessary medicine. 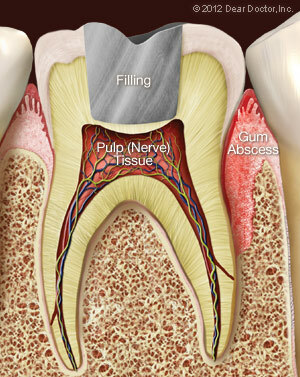 A periodontal (around the tooth, meaning the gum) abscess is sometimes called a gum boil.It is a pus-filled sac that can form between teeth and gums and is caused by an infection. The infection can come from food or other objects that may get trapped beneath your gum line, or from uncontrolled chronic periodontal disease. Pressure can build up quickly inside them due to the increasing puss and hence, abscesses are oftenvery painful. Among the symptoms of a dental injury are: tenderness, swelling of the cheek, or a throbbing toothache which comes on suddenly, and sometimes a fever. Puss draining into the mouth from the puss sac occasionally relieves the pain, but can cause a strange taste in the mouth. If left untreated, abscesses can persist for months and cause serious health problems, including infections that spread to other parts of the body. At least two deaths in USA itself are on record due to neglected dental abscesses. If you notice any symptoms of an abscess, get an appointment with your dentist immediately. Treatment involves draining the pus, thorough cleaning of the area, and controlling the infection.